A Secret Service spokesman told Newsweek Wednesday that the agency intercepted explosive devices that were sent to the homes of the Clintons in New York and the Obamas in Washington, D.C. 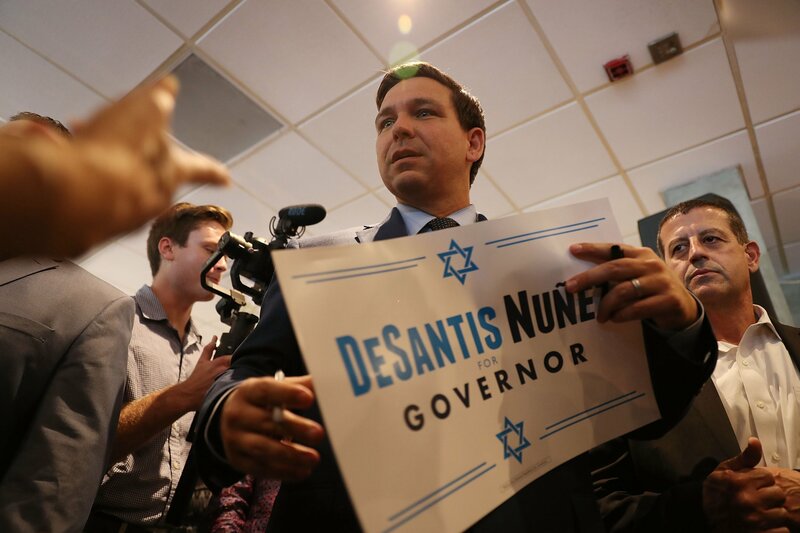 There have been no allegations that the DeSantis email and the suspicious packages are in any way connected. The language used coincides with concerns expressed by critics that certain rhetoric and conspiracy theories levied by the president and other conservatives had the potential to promote violence. The New York offices of CNN were evacuated that same morning due to a suspicious package. Democratic Congresswomen Maxine Waters of California and Debbie Wasserman Schultz of Florida also had suspicious packages sent to them. On Monday, a potentially explosive package was discovered at the home of major Democratic donor George Soros, an 88-year-old billionaire that Trump and other conservatives have alleged is part of conspiracy theories like paying sexual assault protesters on Capitol Hill and funding a migrant caravan. “I want to make sure that Andrew Gillum knows that inviting his failed presidential candidate is the WORST mistake of his campaign,” the DeSantis email said, referring to Democratic opponent and Tallahassee Mayor Andrew Gillum. "I want Hillary Clinton's visit to be a kiss of death," the messaged continued in bolded lettering. Clinton attended a private fundraiser for Gillum on Tuesday near Boynton Beach along South Florida’s east coast. Tickets reportedly ranged from $250 to $5,000. Clinton then attended a dinner in Miami for Gillum’s political action committee, Florida Forward, according to local media reports. On Twitter, DeSantis called the acts of terror "disturbing and unacceptable." "We are grateful to law enforcement and all first responders who run toward the danger, to keep us all safe," DeSantis said. In recent weeks, during a CNN interview that caused backlash from Republicans, Clinton said that people "cannot be civil with a political party that wants to destroy what you stand for, what you care about." Local authorities in South Florida confirmed to local media on Wednesday that the office building home to Democratic Congresswoman Debbie Wasserman Schultz was also evacuated due to a suspicious package. The return address on the packages sent to the Obamas, Clintons and Soros reportedly listed the return address for Wasserman Schultz. The former chairwoman of the Democratic National Committee was scheduled to appear at a campaign event on Wednesday with Clinton and Democratic congressional candidate Donna Shalala at the Coral Gables Woman’s Club, according to a press release from the Shalala campaign. “There can be no gap between our parties on this issue,” Gillum added. Update: This story has been updated to clarify there have been no allegations of any connection between the language used in the email and the series of bomb threats and suspicious packages. It was further updated to include past comments made by Clinton and a statement on Twitter from DeSantis.